so... the wedding was completely awesome. Everything, even the things that we screwed up, did half-assed, or just didn't think of, worked out completely perfect. We'll post for real about a lot of the wedding stuff, especially the eats, but for now we are on honeymoon in NYC. Which means that we are slacking off as majestically as possible. We have barely left the (absurdly swank) hotel room, since it has air conditioning, expensive linens, free champagne, and Utz cheez balls that our friend K gave us before we left. And wireless internet. We did leave once, this morning, to wander out into Soho -- which is disgustingly hot and humid this week -- looking for food. We found a rather good Dominican dive on Lafayette & Spring, La Nueva Conquista, but that is not the point of this post. 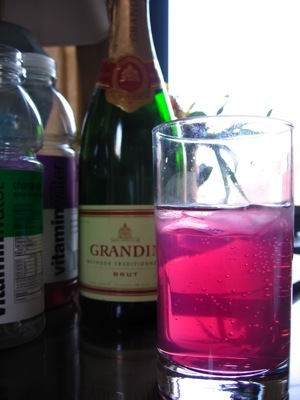 The point of this post is that we have discovered in the course of our excessive slackery that expensive champagne mixed with Vitamin Water makes a surprisingly good drink. We're holed up in the room, looking out at the bright midday sun, lolling on the cool white sheets in the airconditioning, drinking lemon-lime electrolyte Vitamin Water because we've just come in from the heat. And then tallasiandude joked that we should put in some of the leftover free champagne and make wine coolers, ha ha ha. So of course we did, and they're not completely disgusting, but the key is that they make you feel GREAT. Well hydrated AND a little bit buzzy, just the thing for a lazy hot afternoon with not a single thing to do. And let me tell you, having not one single thing to do is the greatest luxury i can imagine right now. We're having a great time. More later. So the caterer had a list of cheeses they were going to serve, which was fine, but some of them were kind of boring. So i suggested Nevat & Etorki, which are two of our favoritest cheeses in the whole wide world. Fine and dandy. Except that Formaggio didn't have them. And then Whole Foods (multiple locations) didn't have them, and couldn't order them in less than a week. At which point, I did what any of you foodwhorish people would do: I googled. And this brought me the miracle of igourmet.com. How did i remain in ignorance of this genius website for so long? These nice people (and they were nice when i spoke to them on the phone) are sending me an entire wheel of Nevat and a half wheel of Etorki (they had at least a dozen of each in stock) along with 2 pounds of an exciting-sounding thing called Marygold, an aged dutch goat cheese flavored with marigold petals. And they are sending this direct to the caterer via Fedex, with a promise to overnight replacement cheeses if anything should be wrong with our order. Yesterday i picked up the first installment of vegetables from our local CSA in Waltham, which was all manner of green leafies (more on that later), plus pick your own snap peas. Which i am now eating while working on the computer, and words do not express how delightful i find that fresh-pea flavor. I will not buy peas fresh in any market, because they are always stale and starchy by the time you get them, and so I rarely get to enjoy the treasured treat of my childhood, fresh raw spring peas. But these little guys are just lovely! Yay. The other night, tallasiandude was in his office eating some candy when I wandered in to ask him something. I saw the M&Ms in his hand and leaned down to snarf a couple up. Whereupon i realized, far, far too late, that they were actually Skittles. I had to spit them out in the bathroom trashcan. Them is some nasty candy, made all the nastier when you are expecting delicious dark-chocolate M&Ms. Eesh.